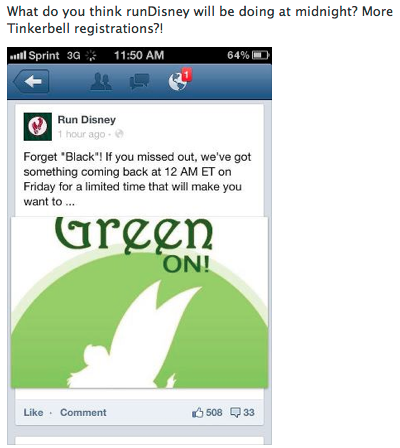 I thought to myself, "If it is more entries for the Tinker Bell Half Marathon, I'm gonna do it". 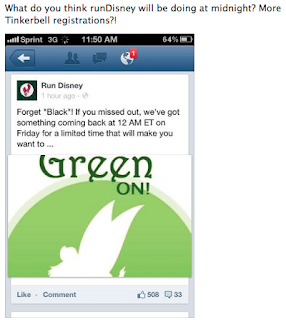 Well, last night my alarm went off to remind me to check runDisney at 9pm and low and behold - MORE TINKER BELL ENTRIES!! So I OBVIOUSLY signed up (on my phone, while playing Cranium with friends, because I didn't want to miss my shot)!! This one, especially since it is just 2 months away, will be more of a 'fun' run (as fun as 13.1 miles can be, hehe) - where I can stop and take pictures with the characters along the way and more of just use it as a training run, rather than for time. It also means that my Princess Half Marathon (at Disney World in February) will be my Coast to Coast race (a half marathon or longer at both US Disney parks in the same calendar year) and I will get a second, extra AWESOME medal (and my family will be there cheering me on)!! Sassy, feisty, and fun loving, Tinker Bell is the fairy we all know and love! Celebrate your inner Miss Bell at the half marathon full of pixie dust and Never, Never Land adventure. You can run. You can run. You can run through the Disneyland® Resort and historic streets of Anaheim, California on your way to a Fairy Finish where you will earn your "wings". Each finisher will receive an exclusive Tinker Bell-inspired Finisher Medal. Stay at a Disneyland® Resort Hotel which are within walking distance from the event or stay at a select Disneyland Resort Good Neighbor Hotel and event weekend transportation is included. A one-year subscription to REDBOOK (a $3.92 value). Offer and refund details. Exactly we people can make the changes in this world according to our desires and needs and everyone should think like Gandhi, he has said everything on point.